If there is one thing that has remained constant with me from a young age, it’s my love for music and songs! I just love all those Hindi and Tamil movie songs I’ve been listening from a very young age. Earlier, it was recorded cassettes. Then CDs. Now it’s MP3. Even though I have many songs in my laptop, I listen to them only once in a week – on Sundays. That’s because it’s difficult to listen to songs in my headphone for a long time. Don’t know why, I’ve never been a fan of headphones, even though the audio quality is the best with them. Cell phones do have speakers. My Motorola Rokr had awesome speakers, but I never got quality music from any other phone I owned after that. I was (am) too lazy to set up my external Alltec Lansing Amplifier/2.1 Speakers with my laptop for a short music-hearing session. Moto Rokr worked even with these speakers, but no other phone works with it. 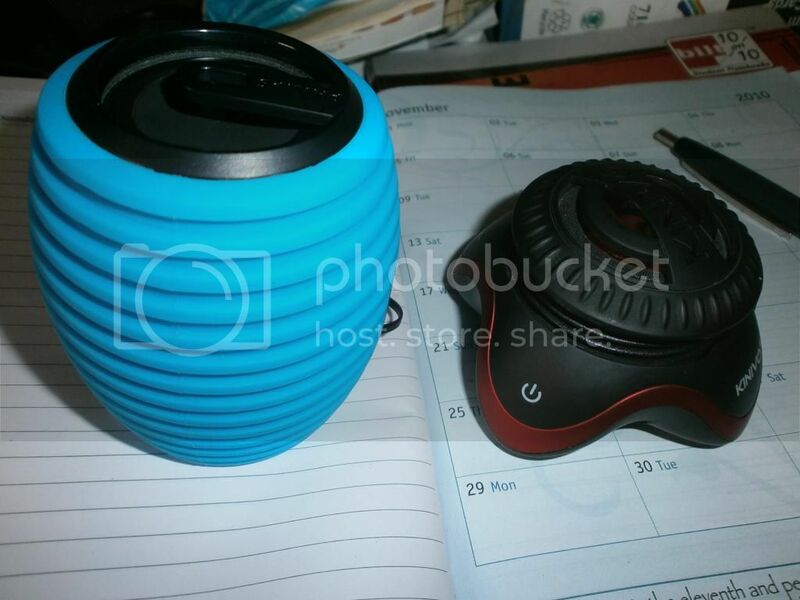 But once I got the Kinivo speaker (photo, right side), I have started listening to songs frequently. When I decide to take a break from my laptop, I take my phone, connect the speaker (battery-powered) and that’s it – I can start listening to songs instantly! OK, the quality/volume is not as good as my Alltec Lansing, but it’s good enough and keeps glued to music. That’s what matters. For some reason – maybe I was not sure about the quality – I never considered buying a personal mobile speaker earlier. The speaker on the left is Phillips and the one on the right is Kinivo. Phillips is louder (and good), but Kinivo is better for softer songs. I am choosy about songs I listen to. So, I don’t listen to the radio much. I hate the constant RJ chattering and the ads. Facebook is good for discovering new songs – I try to listen to recommended songs by friends. Songs that play on TV or the ones that accidentally reach my ears is another source of discovery. But I miss a TV program like ‘Superhit Muqabla’ that ran for many years in DD2. That music countdown program was the best source to discover great songs. Nowadays, I am not sure if there is a good TV program like that, or if there is an alternative Online. Are you aware of any? I am interested to know how you discover new/good songs. Please note: These are personal speakers for your own listening, not room/hall speakers. You can connect it to mobile, tablet, or laptop and keep it next to your pillow or table. I hate RJ chatter too. Mostly I listen to good old Bollywood Music on TV after ten. Just a few melodies and it’s time to sleep. I am completely out of touch with Bollywood songs these days. But I know they make some of the best songs in the industry. Need to find a way to identify good Hindi songs, apart from what is shared on FB. Try “sony mix” channel. They play nice songs – old and new all the time. I think it is the best music channel on TV these days. I usually keep flipping channels and thus learn about new hindi songs. For English songs, I resort to radio. Those are some cute speakers. Never heard of Sony Mix! Maybe we have not subscribed to it. Let me check it out. I am not much of a listener. Contrary to your taste, I enjoy radio and I was glued to it a couple of years ago when I had to commute to college in our college bus. The travel was more than one hour. I love “Dhol baaje” from Ram Leela,the dance is not to be missed either! No, my speakers are not bluetooth-enabled. Not even my headphone. All these connect via the 3.5mm jack. Should check out bluetooth speakers/headphones though! I miss all those countdown music too.. But, Sony Mix and Music India plays good Hindi songs. And, I am completely unaware of channels to hear new Tamil Songs… Although there are Sun Music, Isai Aruni and Jaya Music, none of them play great music. They are too redundant. Yes, the Tamil channels are redundant, but we can discover at least a few good songs vs. nothing! I too don’t like listening through headphones, as I feel headache even for short time. I enjoy music mostly in my Sony home theatre with 5.1 surround sound effect as for me sound quality has to be standard enough. When it comes to TV, I like watching/listening Sun Music HD and programme vice I love Sun Singer where I find listening songs from various times that too in kids voices was quite different experience and connecting with home theatre sounds awesome, since Sun comes with quite HD. I also listen to music while travelling in car. For me new movies expose through newspapers and sometime I come across album release/review of new songs which I try listening but most of the time it’s based on music directors and actors. I enjoy songs/music of any kind as being good in whichever way it reaches me. Good that songs are reaching you or you are reaching to them! For me, identifying new songs is a challenge, especially as I don’t watch TV and don’t read newspaper frequently. Yes, for song lovers & music lovers mobile speaker is necessity. Well, not a necessity, but definitely an add-on. If one is comfortable with headphones, that may still be the best option. I have large speakers, 2+1 type, which we connect for movies. I hear songs on Bose headphones from mobile. I have a huge collection of songs. Must be 7000 songs. Hindi film, Tamil Film, Carnatic, pop and western classical. I come to know of new songs from pirated audio CDs. I do some research using Google search then buy a pirated audio CD once in 4 months or so. I completed “The Archers Revenge” today. It was very interesting. I started in the morning and finished in the evening. Great writing. The visualization was easy to follow. After following your blogs. I too have larger speakers, but I am lazy to set it up for short music hearing sessions! Besides the volume output is high and they might disturb others in the house. Thanks for reading the book and encouraging a new author. I hope to write better in future!